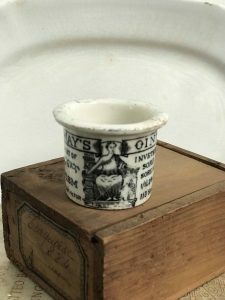 This is a listing for one (1) Mini Holloway’s Ointment Pot. I love the detail on this mini ointment pot with transferred images almost all the way around. On the reverse side is a picture of Mother and Child with a list of ailments. 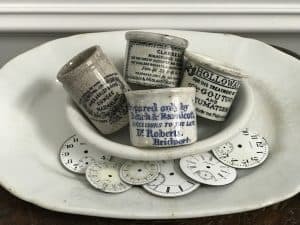 This pot was in use from 1860s to about 1920 from various addresses. This pot is addressed 113 Southwark Street, London. 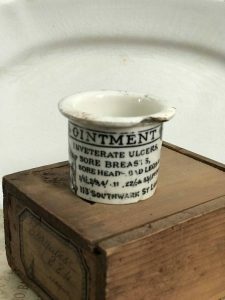 Reads: Holloway’s Ointment for the cure of Gout and Rheumatism – Inveterate Ulcers, Sore Breast’s, Sore Head, Bad Legs & c.
Pot has a chip on the upper rim along with a small one along the bottom. Please consider the images as the best part of my description.